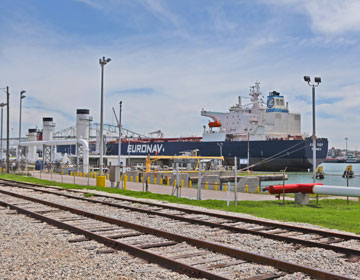 Private equity firm Carlyle Group will partner with the Port of Corpus Christi, the top oil export hub in the United States, to develop a major crude oil export terminal on Harbor Island. Carlyle's announcement comes as infrastructure in the U.S. oil industry struggles to keep up with record levels of production, driven by the Permian shale patch in West Texas. Both international buyers and American producers are waiting for export capacity to increase. Corpus Christi has its own plan to expand operations to handle larger export tankers. Commodities trader Trafigura Ltd is developing its own port about 15 miles off Corpus Christi that would handle vessels able to fully load two million barrels of oil. The terminal is expected to be operational in late 2020.